Do you like Mexican cuisine? How about a delicious meal that can be put together in less than an hour? Now, I am sure I have your full attention. Who after all can say no to less time in the kitchen, and yet tasty food on the table! Thriving fast food joints everywhere are a sure proof to this fact. I am no different! Once I found out that tacos put together at home can hold it’s own to tacos from my favorite joint, there was no stopping me. With fresh ingredients, and chicken that is cooked at home this recipe is healthier. More over, children love this stuff and indulge and for once you don’t have to curtail them from having an extra bite or two. And now, with cricket being my latest distraction, I am thinking it won’t be a bad idea to have some tacos while enjoying the game too. Please agree with me! 1.Marinate the chicken with pepper, oil,salt,lemon juice and garlic powder and keep aside for at least 15 minutes. 2.Boil the stock and add the marinated chicken into it. 3.After 3-4 minutes add the jalapeno slices and continue cooking till chicken is almost done. 4.Increase the heat and cook till all the water is absorbed. 5.Switch off when there is still a little water left, just enough to moisten the chicken. 6.Prepare the shells according to package instructions. 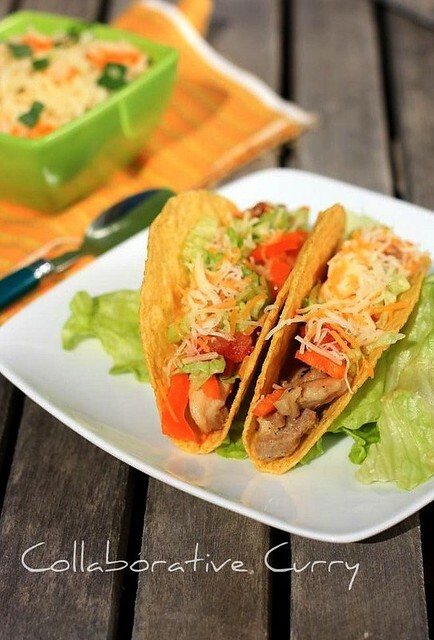 7.Fill them with cooked chicken,sour cream,salsa and veggies sprinkle the cheese over. 8.Place them on a baking sheet/microwave safe plate and warm in an oven at 400 degree F/on high in a microwave for 30-45 seconds, till the cheese is melted. 9.Serve with guacamole and some Mexican cumin rice or as it is. 1.The fillings are completely versatile, as many of you know. This is in my list for a very long time, looks too tempting. Adipoli chicken taco. Njan beans taco kazhikkum. what a coincidence..well actually i just threw out my remaining taco shells cos i was a bit intimidated with all the mexican addiction recently. I set up a taco bar recently whn we were entertaining guests and i cant get enuf of mexican food..i used mince meat and beans as filling though! My fav and i love it Nami..Mindblowing pictures..
Yummy Tacos.Wow nice presentation makes me hungry. i am big fan of mexican food!...in our house quesadillas are more popular than tacos!!! i love tacos tho!....add lots of spice n fresh veggies for me! You woudnt believe if i tell you i have never had this, looks so good. SHould try mexican food at home. 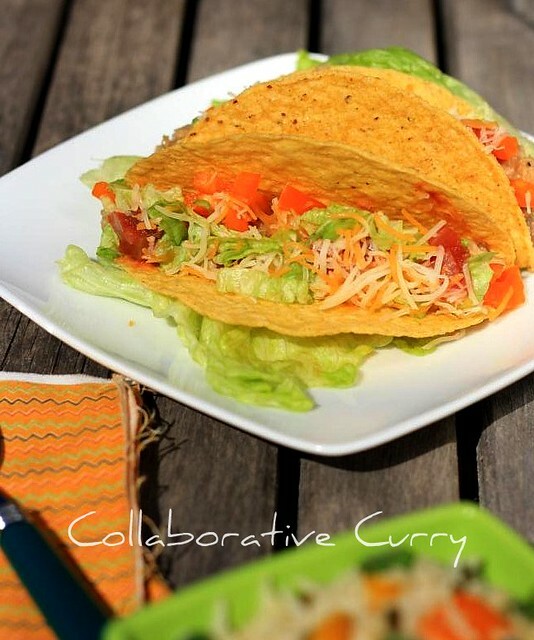 Crispy and yummy Tacos.. Love your clicks..
Never say no to tacos, truly irresistible..makes me hungry..
Love tacos anytime and too with Bean chilli wow i am drooling..pictures are gorgeous. Beautiful presentation dear,makes me hungry. J'adore la cuisine mexicaine et ta recette me donne faim. I too love Mexican food..did you make this tacos to forget the pain of the tied cricket match!!! Loved your tacos!! wonderful clicks as usual! I am a big fan of Mexican food, this luks incredible..luv it. 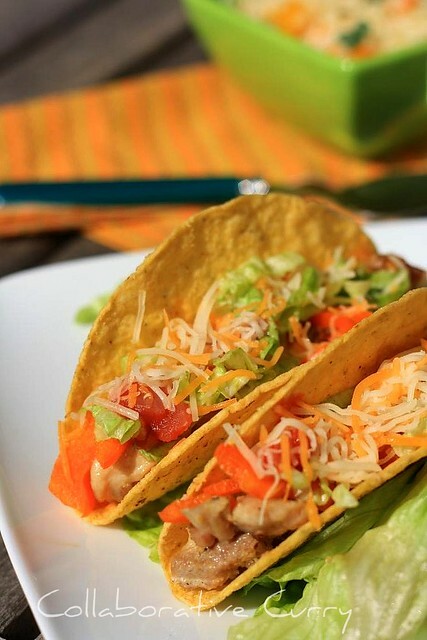 Love chicken tacos in general and this one specifically! Adipoli superb tacos da..mexican recipes eniku athra ishtamilla, pakshe ivide veetil ellavarkum ishtamannu.. 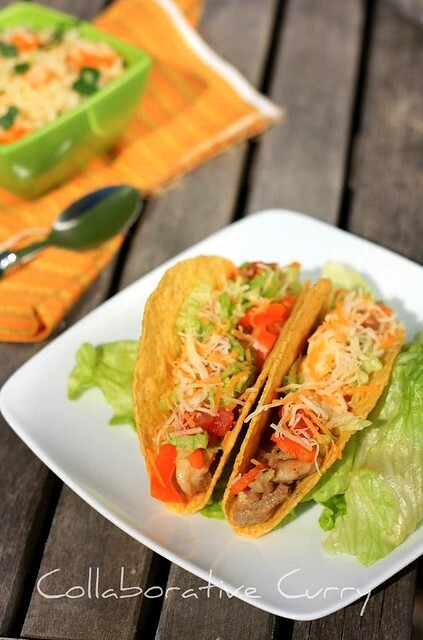 Kids love to put their own topping with tacos. They look perfect and delicious! wow...i love these tacos...thsy look really very delicious. Do check out my recipes at http://onlyfishrecipes.blogspot.com/ and let me know your valuable comments ! Lovely clicks... I am a great fan of mexican foods.. These tacos look delicious. We have tacos on our menu too. My children asked me to tell the restaurant that will do the catering service for us to make Chicken Tacos. Maybe I could lessen the expense if I will try to make this recipe at home. I will ask my mother to help me make this recipe. I always buy tacos for my midnight snack. I think I should learn how to make this Chicken Tacos for a change.